The body has a variety of stem and progenitor cells that can “morph” into regular every-day cells. Most have a restricted repertoire. 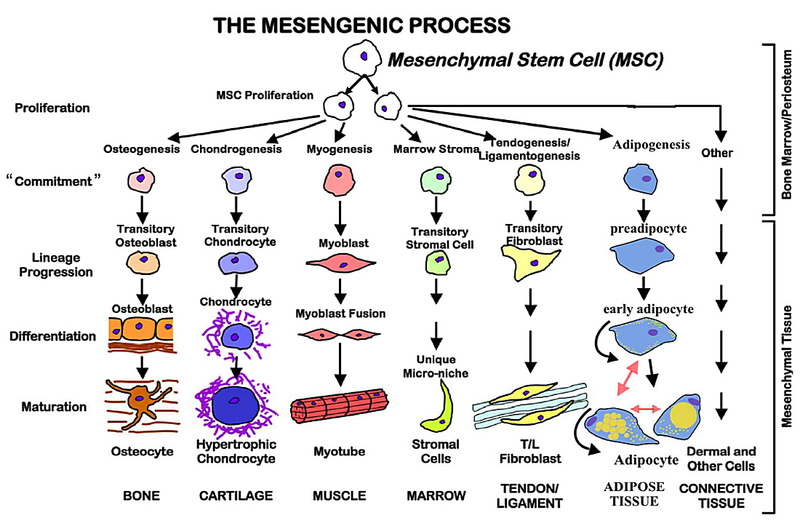 It seems, though, that mesenchymal cells can become a large variety of tissue types. This has great importance for replacement and repair of damaged organs and joints. Some of our cells are permanent: neurons and muscle being good examples, and some renew, like skin, and the intestines. The ones that renew, wear out. To make sure the new cells are fresh and whole, thay are made from stem cells or progenitor cells. Such cells are usually protected. 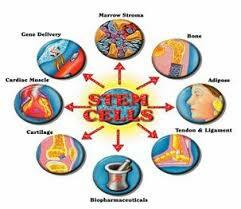 Read all about stem cells here. None of the stem cells in an adult are that powerful. At least in vertebrates: . crustacean’s stem cells are more “stemmy”—lobsters can regenerate all sorts of things—claws, eyes, etc. But for humans, the stem cells are limited, some very much so. The ones that generate intestines, for instance, can generate only the four types of cells the intestines need, and, of course, copies of themselves. Why such limits you might ask? The answer, most likely, is cancer prevention. Cancer is out of control cell proliferation, so it would be a good evolutionary development to try to build some brakes onto this sort of thing. The final cells, skin or intestinal, can’t divide at all. 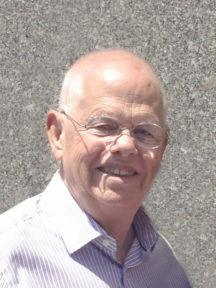 A cancer can’t really start there; it has to start in the stem cells. The stem cells that get the most exposure to life’s varying ordeals are the skin and intestine. The stem cells there are quite limited, and have even been stripped of their lofty “stem” title, and are called lowly progenitor cells. I think most of us would agree that the most protected areas in the body are inside the bones. There’s no ultraviolet light, no caustic digestion, no pushing, no poking, or other unpleasantries going on. It should come as no surprise then, that in the middle of bones—the marrow—are found cauldrons of stem cells. And these are no minor progenitor cells either. With all the protection the bones afford, they are allowed to keep a lot of their potency. One type makes blood cells, both red and white. The white, also called leukocytes, are the body’s police force and come in many different types. The other stem cell residing in the bone is the mesenchymal cell. This one’s day job is bones and cartilage. That’s only a hand full of cells, so why does it have the coveted “stem cell” status? 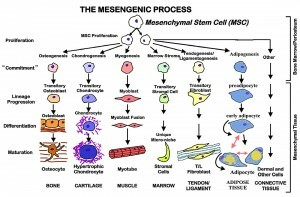 What Can Mesenchymal Cells Do? Fat cells. Few of us need more of these. It is also possible to collect mesenchymal cells from fat, but they apparently aren’t as potent. This is a real surprise. Neurons are very odd and complex cells. Apparently they work. This research is just beginning. Applications are easy to imagine. Para- and quadraplegics, the blind, dementia, and so on. Again done on rats, but improvement in kidney function in rats with obstructed kidneys. Fracture healing. Serious breaks heal faster. Since this involves building new bone, this isn’t much of a surprise. These mesenchymal cells deliver a triple surprise. The first, of course, is that they can become all these seemingly different cells. Different in both function and shape. The other surprise is that it knows what to do. The third, is that it seems to be able to find the spot where it is needed and install itself. Something summons it and triggers it. In the lung research, the researchers simply injected mesenchymal cells into an artery. 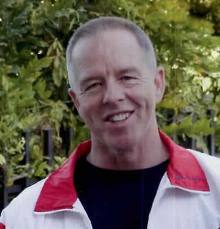 The cells circulated everywhere, but “found” the damaged lungs, settled there, and grew new lung tissue. If this sounds like anything less than pure magic, you are reading the wrong blog. At this point, the future looks bright for mesenchymal cells. There is a catch, but it is a minor one. It has to be your own stuff. Some cells have to be extracted from a bone, but after that a big supply can be built up by culturing them in a lab. If they weren’t your own cells, your immune system would quickly destroy them. For about 15 years, there has been an option at birth to freeze the umbilical cord. This is a rich source of very young, healthy stem cells, and, in principal, could provide a backup source of tissue or even organs for the grown baby. How cool is that? !